One of the most appealing qualities of the album is how the recording takes the listener through a range of styles, many of them influenced by Cline’s extensive sideman experience as both a pianist and a trombonist. 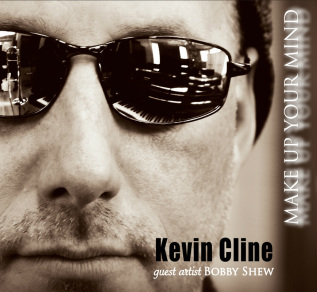 Cline certainly displays considerable skill on the trombone (listen to his excellent solo on “Make Up Your Mind”), but the album definitely focuses on his considerable piano chops. All of the tunes are impressive, with lyrical pieces like “Till Next Time” and “Mistletoe, Me & You”displaying classy piano work . An impressive mix of melodies such as “April In June” give a chance for soloists like soprano saxist Jim Gailloreto to shine, and P aul Zimmerman brings his vocals on hip pieces “Umbrella Sunglasses & Gloves” and “You Tend To.” Clever without being cloying. Not only are the charts superlative, the rhythms engaging, the instrumentation intelligent while harmonic and largely centered upon melodics, but the entire affair is deliciously engineered, creating a milieu that doubles up the music's powers and charm. 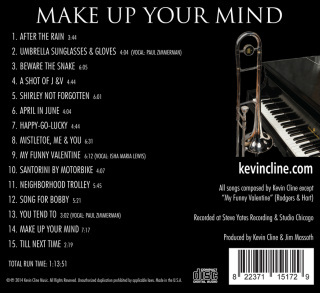 If pianist, trombonist, composer Kevin Cline's self-released album Make Up Your Mind proves only one truth, it is that there is a lot of jazz talent that most of us never get to hear out there, and that is our loss. The songs are good and the musicians and vocalists are superb. This is an album that should be on your must have list. I've been listening to your album over and over again on my iPod. It's such a great recording. Your compositions -- and your playing -- are stellar. Congratulations on a wonderful disc! Please keep doing what you're doing. Tasty stuff that flows with the certain Chicago vibe that let's you tell it's not from either coast, this is a tasty, easy going set that finds him splitting his time between piano and trombone with equal skill. A sure bet for easy chair jazzbos that want something relaxing yet thrilling.